MySQL is a key part of LAMP (Linux, Apache, MySQL, PHP / Perl / Python), the fast-growing open source enterprise software stack. Lamp application being an open source application provides you with a platform for rapid growth in the competitive online market. More and more companies are using LAMP as an alternative to expensive proprietary software stacks because of its lower cost and freedom from platform lock-in. It is mostly free for developing and deploying low-cost, reliable and secure web applications for small to large scale websites. 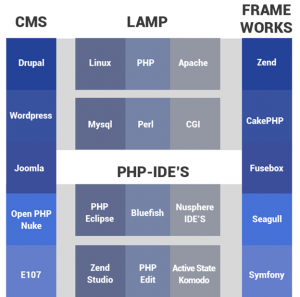 With over 210 million websites being powered by PHP, this record is showing that PHP has gained a significant place in the field of web development in the last decade. Be it making simple websites or developing server side components, PHP has proven its ability in all the fronts of web development. Omkarsoft has been actively involved in developing Rapid Web Development for custom and dynamic web applications based on Linux Apache MySQL PHP (LAMP) technology. Being a professional Web Development Company, we have successfully developed LAMP (Linux/Apache/PHP/MySQL) projects for clients with core businesses in different industries etc. Depending on client specific requirements PHP development team is capable to develop a customized LAMP based solutions from considerably small website to complex internet applications. We have expertise on various PHP application development frameworks and PHP services.